/Personalizing Your Items /Can I save my design and work on it again later? Yes, you can save a design you’re working on at anytime. But, keep in mind, you’ll need to have a PurpleTrail account in order to save your design. We highly recommend logging in or creating an account before personalizing your design. 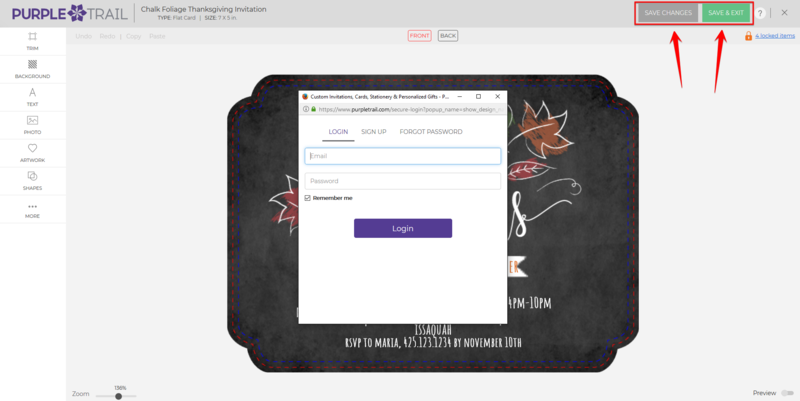 However, if you don’t log in to your account or don’t create an account before personalizing a template, you can hit the Save Changes button in the Design Center, and a log in or sign up box will appear. There, you can either log in to your existing account or create a new one. After doing so, hit the Save Changes button. This will prompt you to either Save and Continue Editing or Save and Finish. Hitting Save and Continue Editing will save your design and bring you back to the design center, where you can make further changes to your design. Hitting Save and Finish will save your design and take you outside of the Design Center where you can begin the order process. After a design is saved, it can be accessed anytime by logging in to your account and clicking on the Saved Designs tab on your Account’s Dashboard. Your Saved Designs page will list all designs you’ve saved. You can click on a design to continue personalizing it or to continue on with the ordering process. We encourage our customers to save designs they’re working on often it to ensure their work isn’t lost. Please note: If you forget your password and are redirected to the Forgot Password page while trying to save your design, the changes made to your design will be lost. This is why we recommend creating or logging into your account before you begin personalizing.